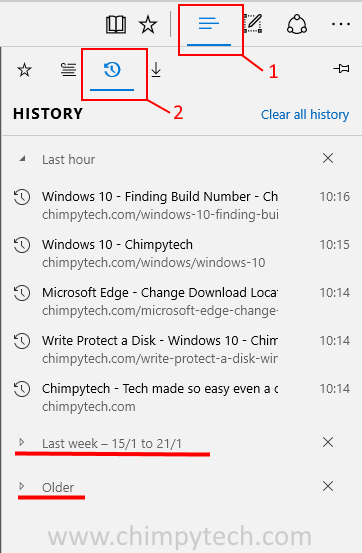 One of the improvememnts Microsoft made with Edge was to make it easier to view browsing history without having to resort to all manner of tricks as you would have to do with previous browsers. Why would you want to view browsing history? The ability to view browsing history can be useful in a couple of obvious situations. You may need to keep a check on what websites other people such as children etc have been surfing to. Of course if anyone clears the cache then the ability to view browsing history will be lost. Click on the ‘History’ tab. You will now see your recent browsing history listed – if there is a site that you want to visit again,clicking on it will take you there. Depending on when the history was last cleared, you may some options to view older subsets of your browsing history. In the screenshot above you can see there are options to view the browsing history from the previous week, and also to view the browsing history from before the previous week.